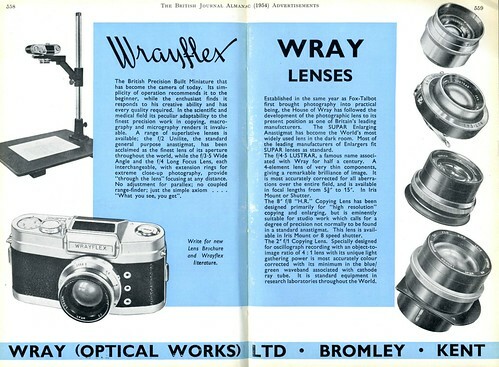 Wray was a British optical company formed in 1850, and best known for lenses used in other makers' cameras. 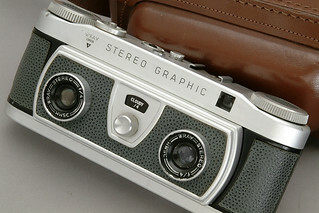 Wray made a couple of cameras after World War II, most notably the 35mm SLR Wrayflex, and sold the Graflex Stereo Graphic camera under its own name. 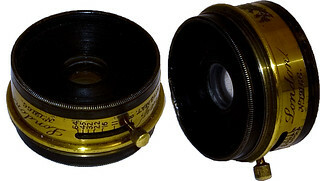 Supar: a simple triplet, most used as an enlarging lens. Unilite: similar to the Lustrar, but with cemented negative elements. Copying/CRT lens: an f/1 lens for photographing oscilloscope traces etc. ↑ Company Notes at Early Photography. ↑ f/4.8 Lustrar at Early Photography; no picture. ↑ 3.0 3.1 3.2 Greenleaf, Allen R. (1950) Photographic Optics, Macmillan, New York, pp201-8. 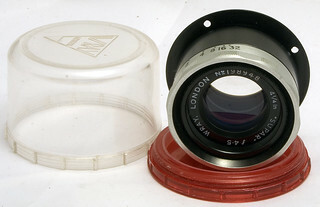 ↑ 135 mm f/4.8 Lustrar for the Wrayflex, sold at Auction 41 by LP Foto Auktioner, on 28 April 2012. ↑ Newman & Guardia New Special Sibyl 6x9 camera, with 4¼-inch f/4.5 Lustrar, sold at LP Foto Auktioner's Auction 41. ↑ Rapid Rectilinear lenses at Early Photography. ↑ 2-inch f/1 CRT lens at Early Photography: diagram, but no photograph.